The CampusCoin Project team releases new website. Campus Ambassador Plan details now available . The long anticipated release of the CampusCoin Project’s newly designed site has arrived. After going through several editorial phases, the final changes to our site are complete and we are proud to announce that CampusCoinProject.org is officially live. Updates include an upgraded user interface, a detailed Campus Ambassador plan, an interactive roadmap, and much more. CampusCoinProject.org is a much better representation of what we are as a team and a community! If you haven’t noticed already, we have made an executive decision to change our websites domain name. With our team recently changing its name from CampusCoin to the CampusCoin Project, it is fitting that our new websites name also change. For that reason, we have changed our domain name from CampusCoin.net to CampusCoinProject.org. The CampusCoin Project team would like to give a special thanks to H7Designs for making this all possible! Welcome to the Campus Ambassador Program. With CampusCoinProject.org going live, our Campus Ambassador program is now online. The release of the official CampusCoin Project website now opens the door for the Campus Ambassador program to begin. 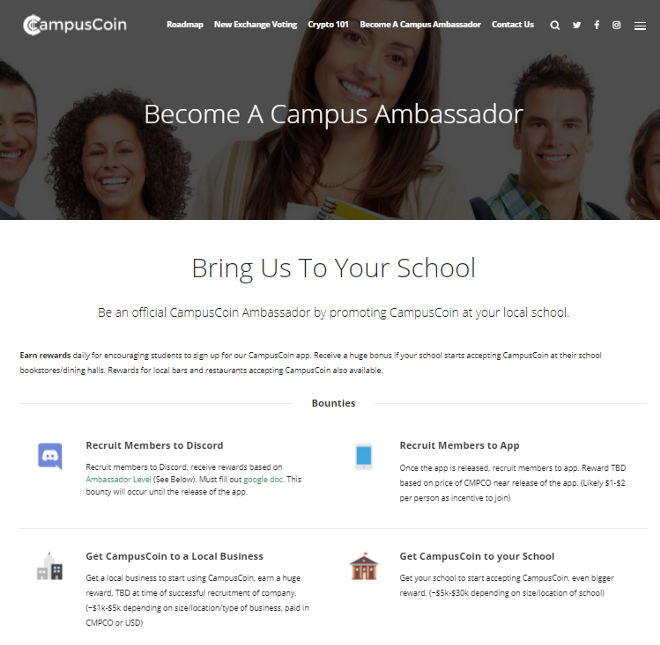 As we wait for the completion of the CampusCoin app, our website’s built in Be a Campus Ambassador page will act as the main HQ for ambassadors. From here, ambassadors will have access to all of the information they need to thrive. If you are interested in viewing the full details of our Campus Ambassador Plan, click here. 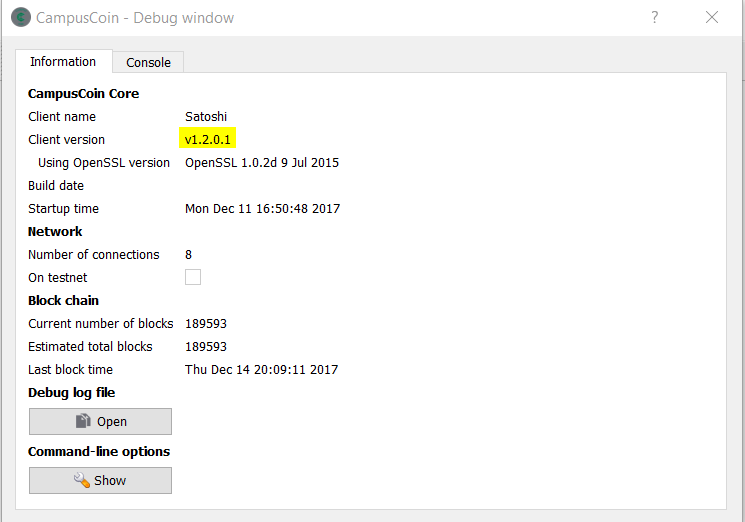 About a month ago, the CampusCoin Developer announced on all medias that all private CampusCoin wallet owners are required to update their wallets to version v1.2.0.1. As of now, a large percentage of our users are using the incorrect version of the wallet, v1.0.0.1. If wallet version v1.0.0.1 is used after block 210,000, users may encounter issues when performing transactions and may lose any CMPCO that is sent. Click on the Help button and then select the Debug window option. If you need assistance downloading v1.2.0.1 of the CampusCoin wallet, please feel free to contact us. Thank you to our community for all of your support, we love you!